Iconic lawman and Texas Ranger Pops Younger has never relied on “Conspiracy Theories” when it came to solving crimes. But the murder of a Texas State Senator was beginning to look more and more like a conspiracy. When former CIA operate and Special Forces veteran Zach Turner divulges reliable intelligence to Younger that the Chief Justice of the Supreme Court was secretly assassinated and made to look like an accident, Younger’s instincts immediately kicks in. Although generations apart in age the two team together and begin to dissect a diabolical plot by the Deep State that extends to the highest reaches of government – including the Oval Office. Intermediaries of the Deep State entice the top Russian spy Vasily Volkov, winner of the Russian’s highest honor - the Order of Lenin to go rogue and execute a ruthless scheme to overturn a Presidential election, change the balance of the Supreme Court and eliminate any and all political enemies. But Younger digs in to uncover the plot while Turner faces the challenge of his own militia leaders going rogue on their own to counter the actions of the Deep State within the federal government. Not until a Deep State operative is captured does Younger learn the lengths at which the Deep State will go to keep power. The convergence of a complex calamity comes full circle when Marine One is shot down leaving the White House Lawn by a shoulder-fired crashing at the base of the Lincoln Memorial and the Deep State erupts into a cataclysmic – and totally unexpected ending! David Thomas Roberts’ definitely fits the description of a modern-day Renaissance Man. Roberts is a serial entrepreneur, inventor, and author. Roberts founded a telecom technology firm based on a software idea he created and patented. Roberts’ first foray into the world of writing resulted in his inaugural political suspense thriller, “Patriots of Treason,” which was followed by “A State of Treason” which won several Best Fiction awards and became bestsellers. Roberts’ experience with his inaugural book again fanned the flames of his entrepreneurial spirit as he launched Defiance Press & Publishing (Defiance Press). Roberts also has penned “Unemployable: How to be Successfully Unemployed Your Entire Life.” Although this book crossed into a completely different genre (Non-Fiction: Business), Roberts again experienced success as “Unemployable” was awarded Best Business Book of the Year – 2017 by the Texas Authors Association. 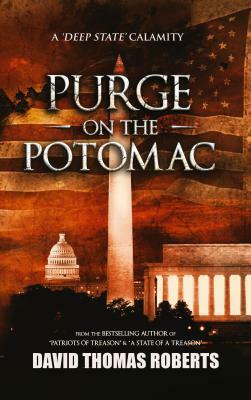 Roberts will again be delving into fiction and non-fiction with his new release “Purge on the Potomac” and his expose on the IRS in “The Death of Liberty” in which he collaborates with Congressmen, Senators and several IRS whistle-blowers on the recent IRS scandals and how the 16th Amendment has encroached on American liberties.